How long will it take my horse to learn use the Bar-Bar-A? Horses usually take less than an hour to learn with some learning in less than 15 minutes. Cattle and other livestock can take 6 to 12 hours to learn. Will the metal paddle burn my horses lips when they push it? We learned many years ago that aluminum does not retain the heat like steel. All of our waterers use paddles that are made from aluminum. Also, horses, cows, and other livestock push the paddle with their hairy chins (not their noses) so there is a good buffer between their skin and the paddle. In addition, these animals have skin that is 3-4 times thicker than human’s skin. What would be hot to the touch for us is not a problem for animals. How many animals need to use your automatic trough waterer to keep it from freezing? Some of our competitors require at least 7 animals using their automatic waterers to keep them from freezing. Our non-electric horse and livestock waterers do not need any animals using it to keep it from freezing. Whether watering 1 or 30 animals, it will successfully work. Is the Drinker too low to the ground? Horses naturally drink from streams, lakes and water that are at ground level. The lower to the ground they drink the more comfortable it is for them to drink. If they have to reach higher to drink it partially closes their wind pipe and becomes more difficult and uncomfortable to drink. In addition, the unit is low enough that animals cannot have leverage on it if they try to rub or push on it. As for potential defecation in the unit this rarely happens. In our nearly 30 years of putting our units in stalls we have found about 2% of our customers experience this issue. For those 2% we have multiple remedies that will cure the issue. Can the Drinker also be used in stalls? All of our automatic horse and livestock waterers can be used in stalls or pastures. Which unit will work for me? Choose the type of animal you have from the drop down menu. If you have more than one type of animal, refer to the multiple animal guide below (*). If you live in a warmer climate with frost lines of 12 inches and less you may use one of the non-insulated Drinkers. If you live in a colder climate with frost lines of 13 inches or greater you will need the insulated Drinker. * Multiple Animal Guide – If you have a variety of animals, this guide will help in choosing the best model. Sheep, Goats, Cows, and Horses- Choose the sheep Drinker; it will work for all of the animals listed. Horses and Cows- Choose the cattle Drinker; it will work for both animals. Cows and Goats – Choose the sheep/goat Drinker. Llama and Deer – Use the same criteria for sheep and goats. Bison- Use the same criteria for Cows with other animals. The installation process is simple to hook up and install and generally takes about 2-3 hours with a backhoe. How many animals can use one Drinker? Generally 25-30 animals can use 1 Drinker. 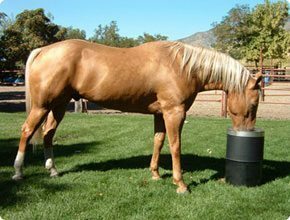 Can I use one horse waterer between two stalls, pastures, or corrals? All of the Bar-Bar-A waterers can be placed between stalls, pastures, and corrals. This saves money on the number of units you will need; money that can be used in other areas of your operation. What is included with the Drinker when it comes? The Drinker comes with all the essentials that make it operable. All the internal workings and hoses are included. The hose inside the unit has been pre-measured so that you have enough hose to pull the unit to the top of the ground for servicing. You will need to provide the water line hose/pipe bringing water to the Drinker, gravel, and the sleeve that is installed around the Drinker tube and housing. For extreme climates additional insulation is recommended that is detailed on the installation graphic for extreme climates. Drinkers range from $419.00 to $494.00 depending on the climate, animal, and options selected. Our Drinkers are some of the only water systems that will pay for themselves in climates that use electricity to heat the water. The savings on electricity can be substantial on a year to year basis. Will I have to clean algae every week? Because the Drinkers do not retain water there is no opportunity for algae to grow. Many people buy our competitors products only to find that they are still scrubbing algae every week. All our products make that part of owning animals obsolete. What about Zika and West Nile Virus? Because we have no standing water in our horse and livestock waterers, mosquitoes find other places to lay eggs and congregate. As a result the potential for damage to animals and people from Zika and West Nile Virus is greatly minimized. Why would I buy this unit over some other product? Most options available for automatic waterers either use electricity or use stagnant standing water in their systems. You wouldn’t want to drink from standing water and neither do your horses. The Bar-Bar-A does not use electricity or have standing water.